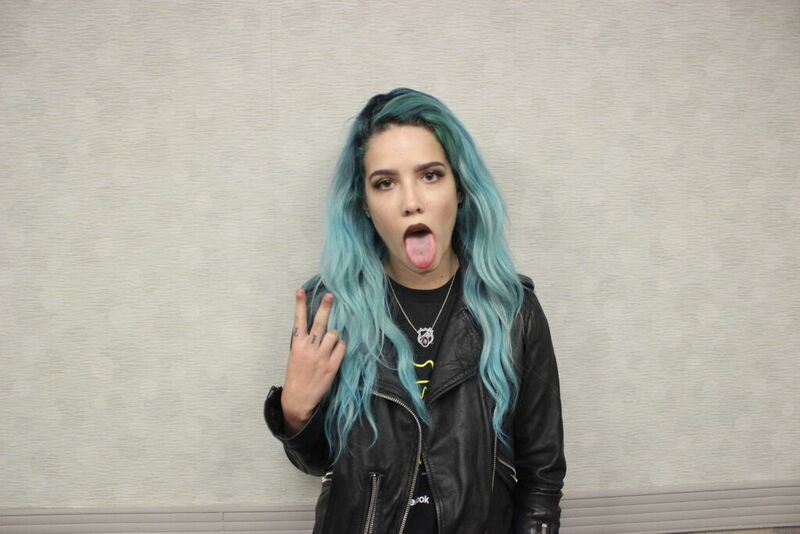 Original to herself and her craft, Halsey is a 20-year-old on the rise. Hailing from Brooklyn, Halsey’s list of accomplishments are already piling high, and continuing her success, Halsey was invited to join Imagine Dragons for their North American “Smoke + Mirrors” tour. This tour is a big jump for the singer, who is about to release her debut studio album Badlands later this summer, as Halsey has gone from nightclub and small venue performances to now performing for packed arenas. For her Chicago set last night, Halsey performed many songs from her recent release EP, Room 93, while she also featured songs from her upcoming album. Halsey’s performance was greeted with a large crowd in attendance just for her. Her gripping voice was accompanied with her suggestive powerful lyrics. We spoke to Halsey after her performance, to see if she enjoyed the Chicago crowd as much as the Windy City enjoyed her set. Halsey also had nothing but great things to say about her fans. “The fans are pretty intense and authentic and I love each and every single one of them to death. Something we struggle with me being a musician rather than a personality because a lot of kids relate to me and that’s a beautiful thing but at the end of the day I’m an artist and I’m here to perform.” And if you didn’t get to catch her performance last night, don’t worry because you will definitely have another chance real soon (find a tour date near you at Halsey’s website). “My fans are incredible, they sold out my headline tour for me. I’m so excited to get back on the road and go see them across the in U.S. in a couple of months in a tour for the album. It’s going to be amazing, nothing is better than playing a headline show because every single person is there for the exact same reason, which is you.” And while it isn’t a headlining set, we can only imagine that Halsey is excited to return in just a couple months for Lollapalooza. Canadian indie rock band Metric opened up for Imagine Dragons. Enthusiastic lead vocals from Emily Hanies provided the energy to the crowd for their performance. Hanies’ free spirited and relaxed demeanor provided for a spirited feel, as the band brought the crowd to a new wave celebration. On tour to help support their upcoming sixth studio album release Pagans in Vegas (which is set to debut in late September), Metric provided Chicago fans a look inside what’s to come. From the start Imagine Dragons created a nonstop thrill ride that had everyone out of their seats. The live performance could have been measured by the sheer intense atmosphere created. Not often does a live performance live up to the studio quality that were used to, but Imagine Dragons surpasses that expectation by giving a chill defining live performance. The band performed all their top songs, with a set list that included: Deamons, Forever Young, Bet my Life, of course Radioactive, and many more. With Radioactive closing the show, the thousands of fans that filled in the Allstate Arena during a massive thunderstorm together, for a rock anthem sing-along. To close the night, lead singer Dan Reynolds finished the show by thanking everyone for attending when they instead could have been watching the Chicago Blackhawks play the Tampa Bay Lightning for the Stanley Cup. He also announced when the Blackhawks won the Stanley Cup as he put on a Blackhawks cap. Go Imagine Dragons, Go Halsey and Metric, and Go Hawks!